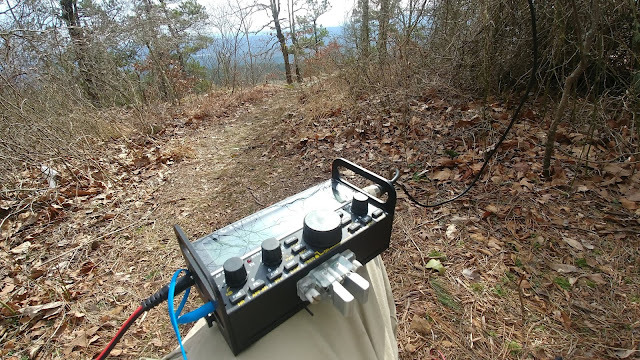 On Monday we were having another 70-degree day so I hopped in the pickup to do another Summits On The Air activation in Arkansas. My destination was Petit Jean Mountain, which is about 10 miles south of Mount Magazine and on the south side of the Petit Jean Valley. This is not Petit Jean State Park, which is actually on Mud Mountain, which creates some confusion. I had read the notes on the summit. It sounded like there was good National Forest Road right to the summit, although the last mile might require hiking. That's a common scenario here in Arkansas. Many of the summits had fire towers on the top in the past, which have long been abandoned. 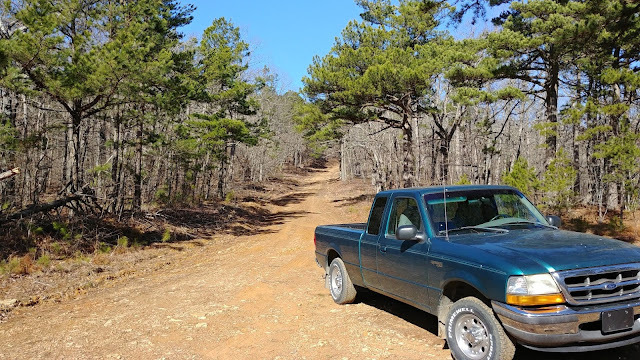 But the roads often remain, either as trails or as rough roads that are probably above the capabilities of my Ford Ranger. February is a good time for SOTA in Arkansas. The leaves are off the trees, so you actually have some views from the summits, the chiggers and ticks are dormant, the poison ivy is gone for the winter and the temperatures are often in the 50s and 60s. Yesterday, February 2, was a good example. The high in the afternoon was 62, so it looked like a good day to head for the hills. I did the two easiest and closest summits to my house -- Crystal Mountain (W5A/OA-008) and Oak Mountain (W5A/OA-006). They are a few miles apart on a well maintained -- for Arkansas -- National Forest Road and both require a quarter-mile hike or so. I had done both summits in 2017 and 2018, but decided to knock the pair of them out early this year. It was also good practice in doing multiple summits in a day.